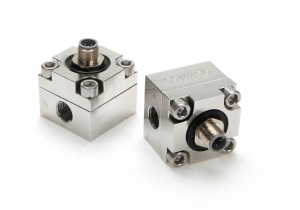 The compact rugged OG2 oval gear flowmeter is designed to give high performance with a low cost of ownership. 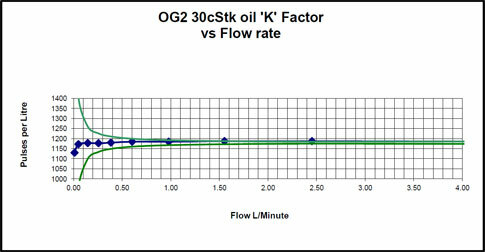 It has a standard flow range from 0.03 to 4 L/min on 30 cSt oil and 0.15 to 4 L/min on water like liquids. It can have totally non-metallic wetted components, PEEK™, ceramic and an elastomer which makes this the ideal choice for the metering of aggressive chemicals. The standard inlet and outlet are ¼' female threads. 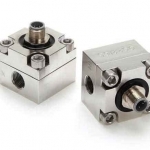 For OEM use alternatives, including manifold mountings, are available. The standard model is 316 St St with Viton™ 'O' ring seal. At the heart of the meter are a pair of toothed oval gears one of which contains chemically resistant magnets. Rotation is detected through the chamber wall by a Hall effect detector or a reed switch giving approximately 1100 pulses per litre passed. 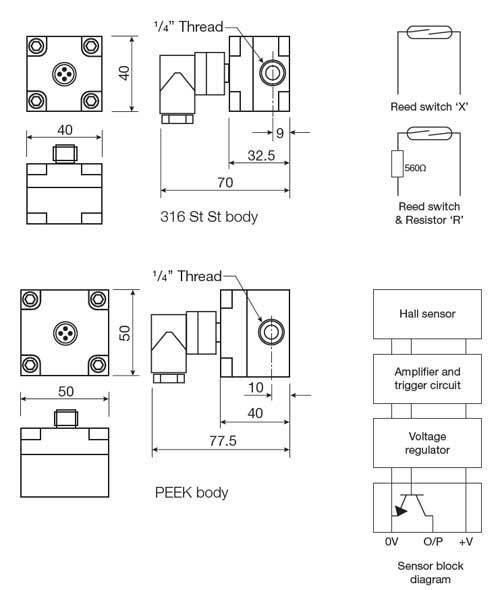 The output is an NPN pulse or a voltage free contact closure either of which is readily interfaced with most electronic display or recording devices. This combination of materials and technology ensures a long life product with reliable, accurate operation throughout. and a 1/4' BSP thread. 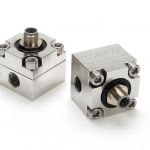 Viton™ is the standard material for the Titan OG2 oval gear flowmeters, although nitrile and EPDM are available as options. 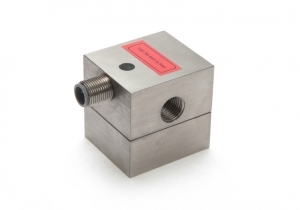 Due to the vast number of differing chemicals that can be put through the flowmeter various other elastomer materials may be available for the flowmeter of your choice. Please contact your sales representative for technical help on this matter. The standard magnet material is ceramic which has very good chemical resistance in a wide range of fluids. They are attacked by some very strong acids and should be replaced with coated magnets if this is the case. The alternative coatings are PTFE and PVC depending on the meter size or the detection method, consult your representative for more information. PEEK™ is a high temperature engineering thermoplastic. 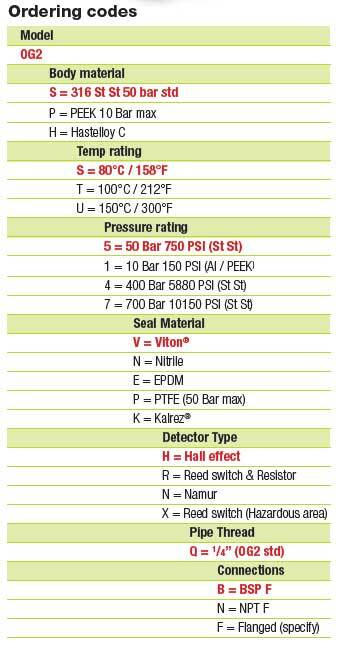 It is tough, rigid and strong with very good chemical and radiation resistance. It retains its excellent mechanical and tribological properties at high temperatures. This valuable combination of properties makes PEEK™ an ideal material for our gears. The grade of material used is carbon fibre reinforced with added graphite and PTFE, these additives give extra strength and reduced friction but remain captive in the material matrix and do not compromise the chemical resistance. Alternative gear materials may be available, contact your distributor for more details. 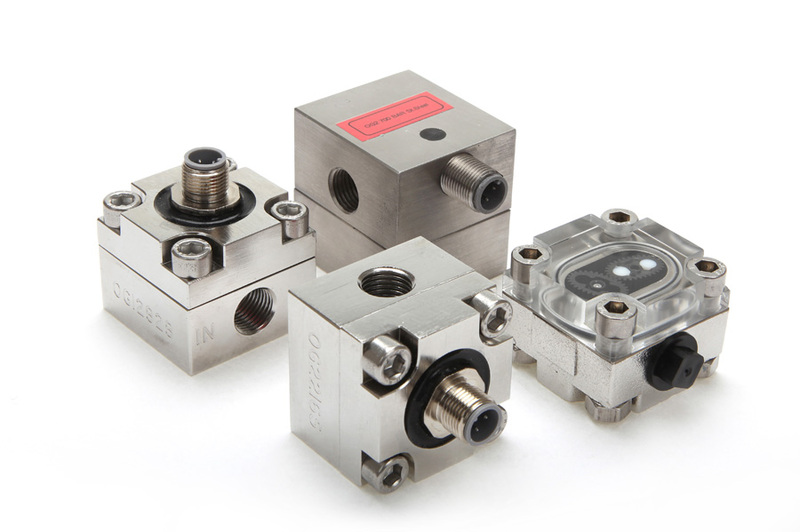 Because of the high temperature characteristics of PEEK™ we can use the same material for all flowmeter temperature ranges. The standard meter is manufactured for use up to 80°C (176°F) but optional rotors are available for 100°C (212°F) and 150°C (318°F). The operation of the meter requires specially modified gears for use with high viscosity fluids, over 1000 cps. Above this viscosity the maximum flow capacity of the meter is reduced and the gears are modified. The low flow capability and the overall accuracy both improve dramatically. 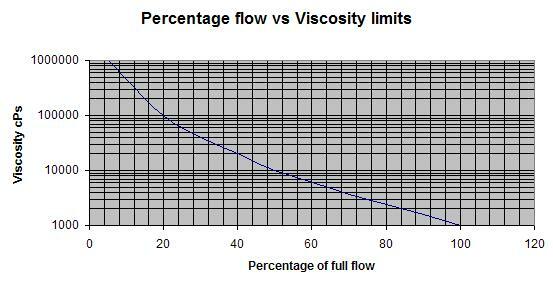 See the graph below for the percentage reduction in maximum flow with these thicker fluids. The standard products are shown on the appropriate data sheets but any meter can be manufactured with alternative fittings to suit your application, consult your distributor for details.